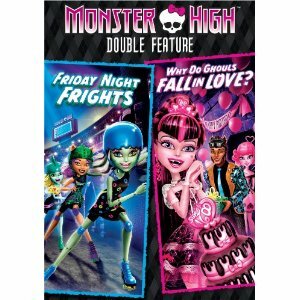 To celebrate the release of Monster High™: Why Do Ghouls Fall in Love and Monster High™: Friday Night Frights on double-disc DVD. The monsters are back with their latest misadventures, and Draculaura’s bestie ghoulfriends help her make an important decision in time for her big sweet sixteen hundredth birthday! So kit Heath have come up with some fab ideas how to make your own bracelets. Make Your Own Monster High Button Bracelet! 1) All you need is a collection of your most gruesome looking buttons (we’ve used ones from old clothes we love), and some round elastic cord! 2) Cut the elastic cord so that it will go around your wrist twice, fold in half, tie a knot to form a loop and start to thread your buttons on. 3) Thread your buttons in any order you want, you’ll need more buttons than you think as they overlap a little – but that’s a good thing! 4) Tie a knot in the elastic when you’ve threaded enough buttons on to go round your wrist and use the loop of elastic to go over the last button and form your Monster High bracelet. Don’t forget to be adventurous and stay true to the Monster High motto: Be yourself, Be unique, Be a monster! Tip – Try stacking buttons, for a double dose of ghoul power, or adding tiny ribbons for an even more frightful look! Go blue for Lagoona Blue or pink for Draculara, create a wolf collar style for Clawdeen Wolf or an Egyptian style bracelet for Cleo! The Monster High™: Why Do Ghouls Fall in Love and Monster High™: Friday Night Frights double-disc DVD is the perfect celebration of ghoul power to enjoy with your bestie ghoulfriends. It is available on Blu-Ray & DVD to pre-order now and contains special features and bonus material making it a guaranteed screamfest! clawdeen wolf - what a great name!